A few weeks ago my anh (adorable new husband) and I took a second honeymoon to Niagara Falls. Actually, I was scheduled to speak at the American Culinary Federation Conference on the topic of wine and food education, but…why miss a chance at a second honeymoon? We took a few days of R&R after the convention ended, and had a wonderful time!!! Admitedly, Niagara Falls, at least the New York side where we stayed, is far from a culinary mecca. However, as it turns out, our hotel was just a few blocks away from a wonderful wine bar, complete with a smart, compact, international selection of wines by the glass and the bottle as well as a delightful menu of plates, both big and small. 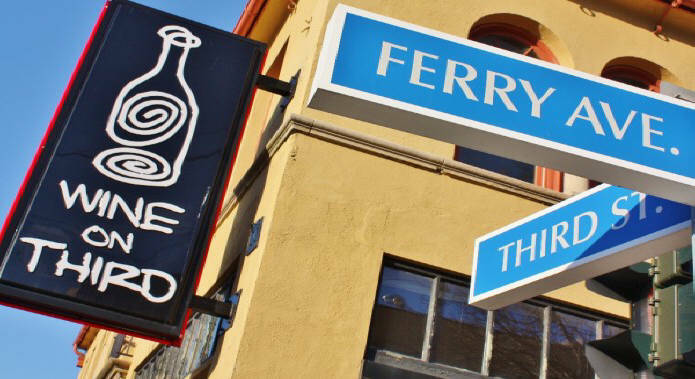 The name of this gem is “Wine on Third” and it is located in the middle of the entertainment district of Niagara Falls on (you guessed it), Third Street. From what I heard from my fellow conventioneers and hotel guests, we definitely happened upon the best dining choice in the area when we discovered Wine on Third. 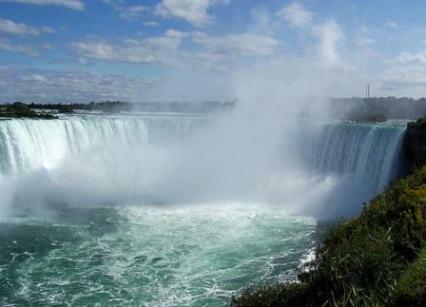 As far as the falls themselves, nothing I have ever seen can compare in terms of pure grandeur and natural beauty. We spent a lot of time close to, on top of, and below the falls. Shields T. enjoyed the outdoorsiness of it all and I love the relaxation and the positive vibes of the falling water. However, as amazing as the falls were, the highlight of our trip turned out to be found not in a waterfall but in a bottle of pink bubbly. On the Sunday after the conference (complete with gala awards dinner and looooong speeches) ended, we walked across the Rainbow Bridge into Canada and rented a car. 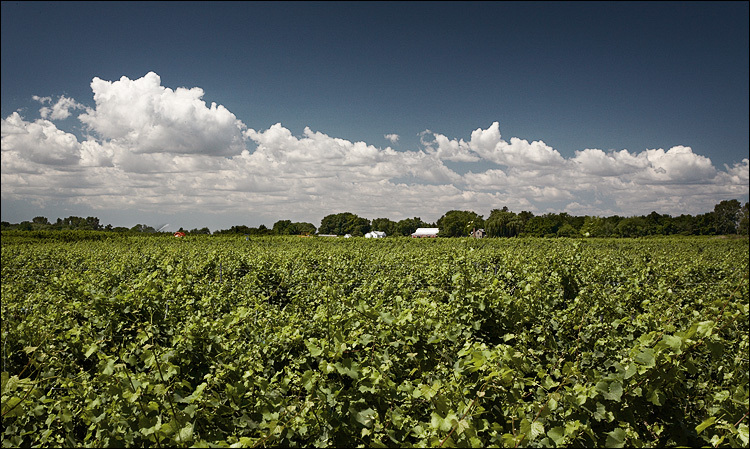 We took off for a lovely drive and headed for the Niagara-on-the-Lake wine region, a mere 15 miles away. I was expecting a homespun, charming wine country with big red barns, sweet red wines and big yellow tractors. Let’s just say, I was way, way wrong. The entire region of Niagara-on-the-Lake is awe inspiring. The vineyards are lovely; gorgeous rolling hills of row upon row of vines bordered by Lake Ontario. Most of the wineries are big and modern; some almost seemed like gleaming, shiny shrines to winemaking. A few more are smaller, artisanal producers of fine wine. The tasting rooms were sleek and well-staffed. And the wine….let’s just say I am impressed, and have a whole new appreciation of Canadian wine. I had done a good deal of pre-vacation research and booked a Sunday brunch at Peller Estates Winery as our token fine dining excursion of the trip. The winery webpage showed an impressive winery complete with an elegant dining room and a “local celebrity” chef. The chef, Jason Parsons, turned out to be not just a local celebrity but a genius in the kitchen and we enjoyed not just the best meal of the trip, but one of the best meals of our lives. Soon after we were seated in the very gracious dining room, my new favorite Sparkling Rosé in the world appeared magically before our eyes. At least that is what seemed to happen. 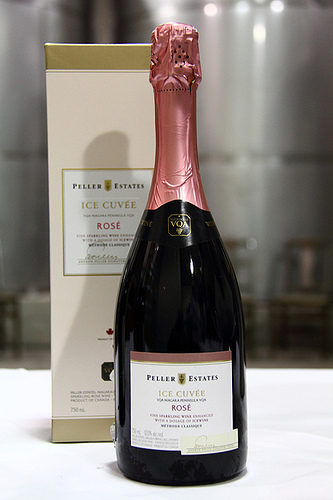 In reality, our server brought us each a complimentary glass of Peller Estates Signature Series Ice Cuvée Rosé. Those of you who are avid readers of the blog know that I adore a good rosé, especially “serious” rosé, and this is some serious wine. 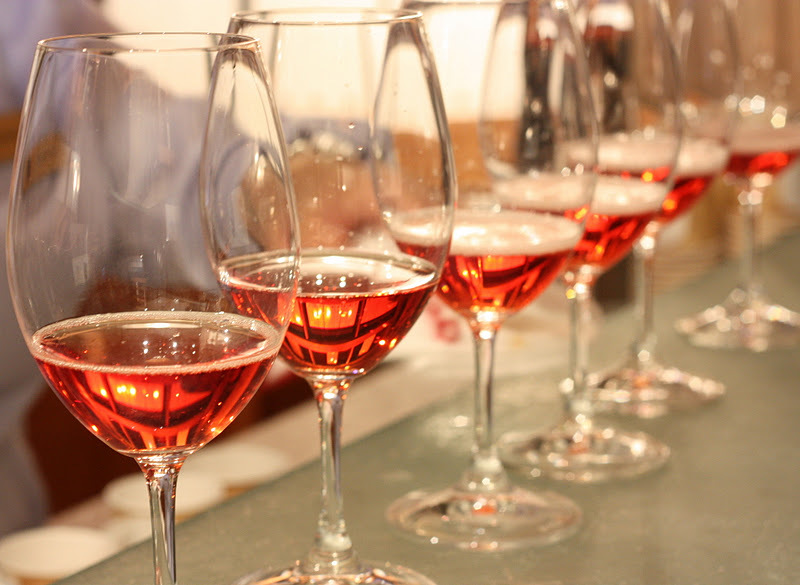 This is not your mama’s sparkling white zinfandel. It may have a hint of sweetness in it, but it balances with a bracing, cherry-squirt of acidity and has the complexity of a bottle-fermented sparkling wine to boot. I detected aromas of strawberry, white peach, watermelon and red currant hovering just about the biscuit-toasty-leesy complexity of sur lie aging. The crisp, taut flavors of raspberry brioche came rushing through, followed by a lingering finish with just a cusp of lemon-peel bitterness to keep you in a serious state of mind. If you prefer, go ahead and ignore the annoying tasting notes, just know that this wine is delicious, refreshing and complex. It keeps your mouth watering with just enough fruity flavors and acidity so that you just can’t help reaching out for one more sip. On a technical note, this is a methode champenoise, traditionally made sparkling wine based on a blend of 55% Chardonnay, 35% Pinot Noir, and 10% Cabernet Franc, all hand-picked from the winery’s surrounding estate vineyards. After a second fermentation in the bottle, the wine is aged sur lie 12 to 14 months, followed by a quick dégorgement and a dosage of the estate’s Cabernet Franc Ice Wine. The Ice Wine dosage adds up to just 25gr/L of residual sugar, keeping this wine somewhere around what the French would call “Extra Dry” but what I detect as just barely sweet. That “barely sweet” sweetness is brilliantly balanced with the acidity and bitterness of the palate and the finish. All in all, this wine adds up to one spectacular sparkler. You might have trouble finding this wine in the States, as I did. You could try ordering direct from the winery, if it’s legal in your state, but believe me…this wine is worth the drive to Canada. Just don’t forget to take a look at that big waterfall on your way out to Peller Estates.